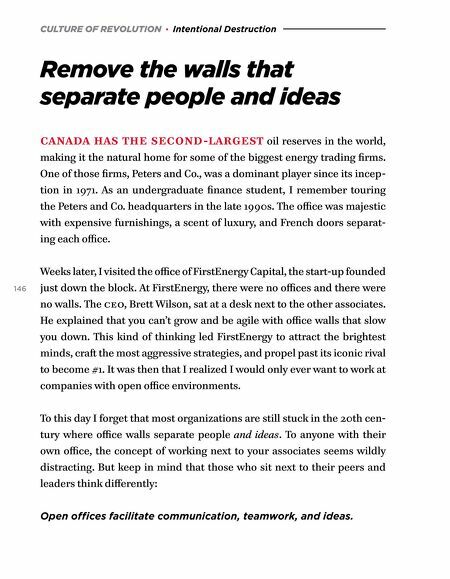 CULTURE OF REVOLUTION · Intentional Destruction Remove the walls that separate people and ideas CANADA HAS THE SECOND-LARGEST oil reserves in the world, making it the natural home for some of the biggest energy trading firms. One of those firms, Peters and Co., was a dominant player since its incep- tion in 1971. As an undergraduate finance student, I remember touring the Peters and Co. headquarters in the late 1990s. 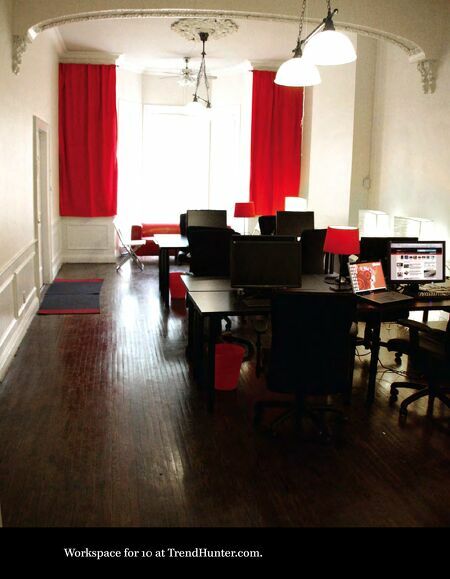 The office was majestic with expensive furnishings, a scent of luxury, and French doors separat- ing each office. 146 Weeks later, I visited the office of FirstEnergy Capital, the start-up founded just down the block. At FirstEnergy, there were no offices and there were no walls. The ceo, Brett Wilson, sat at a desk next to the other associates. He explained that you can't grow and be agile with office walls that slow you down. This kind of thinking led FirstEnergy to attract the brightest minds, craſt the most aggressive strategies, and propel past its iconic rival to become #1. It was then that I realized I would only ever want to work at companies with open office environments. To this day I forget that most organizations are still stuck in the 20th cen- tury where office walls separate people and ideas. To anyone with their own office, the concept of working next to your associates seems wildly distracting. But keep in mind that those who sit next to their peers and leaders think differently: Open offices facilitate communication, teamwork, and ideas.